Yet another set of characters for an un-produced animated feature project. 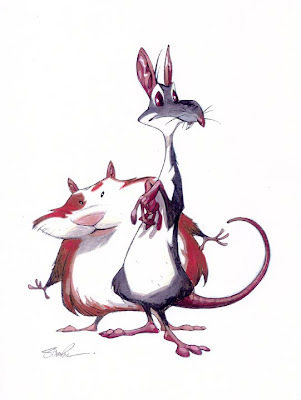 Enjoyed trying to angular-ize my default rats, the ones that wind up in any on my comic projects though I still opted for my standard droopy nose. Was fairly pleased with the Guinea pig as well. Awesome! I love your work and probably spend way too much time looking and re-looking through the archives of this blog. Haha, these are great.I love the color more than anything for whatever reason. I hate hamsters though. They always bite! I hear you're doing an interview for samandmax.co.uk. Good to hear! Lucas Arts announced today at the Game Developer's Conference the Secret of Monkey Island 2: Special Edition, and reunited Ron Gilbert and Tim Schaefer on stage. Any new art you can preview? Did they ask you for another great cover? Is there ANY hope for us MI fans that Ron's CRAZY MI3 might ever see the light of day, and if it did is there any way you could be involved? Nope. Never heard a thing about it until everybody else did. Glad it's being released again but not crazy about the repaint of the cover. Makes it look like a Lego game. Why not just do something new instead? They would have looked great in a Don Bluth film! Speaking of MI, why has an MI comic project never been done? Man, that would be cool.